Every other month of the year, the strawberries we can get are either the big, beautiful, and tasteless Driscolls berries or a bag of the frozen variety. But come June in the Pacific Northwest, the local strawberries finally ripen, and for a few weeks, we can gorge ourselves on strawberries that are red all the way through, sweet verging on a banana-like taste, and so soft that the merest touch will smush them. The best and most delicate? Most folks award the title to the highly coveted Oregon Hood strawberry, although several varieties of the berry are grown in the region. 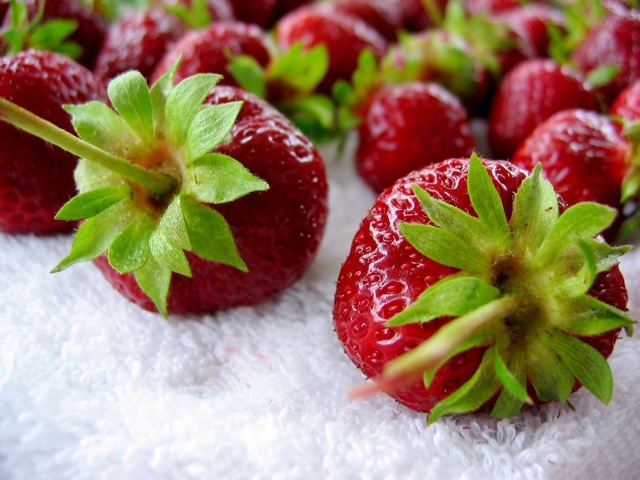 I like strawberries picked straight from my strawberry plants, warm from the sun and intensely sweet. Drizzled with a little balsamic vinegar, they play a compelling game of sugar and sour. Häagen-Dazs boasts that it uses only Pacific Northwest berries in its strawberry ice cream. The Oregonian agrees that, while strawberries alone are pretty darn satisfying, strawberries with cream is even better. Of course, you can also add strawberries and cream to cake, for the classic American combination of strawberry shortcake or the traditional British assemblage known as trifle. And if you can bring yourself to add heat to the fresh berries, try them in a pie or even on the grill. And finally, on our to-try list is a new strawberry dumpling recipe from Gourmet — just as soon as we can stop eating them by the handful.